The above info came from Who Wants to Know?, and was edited by yours truly (contact me). The image came from Bad Karma GUNDAM. By 1994, the universe of Mobile Suit Gundam had been in existence for 15 years. As a way of injecting new life into the still-popular franchise (which had since seen movies and sequels), Bandai (who had acquired Sunrise) decided to let new talent branch out the concept of "Gundam" and create alternate universes, creating new Gundam stories. Masashi Ikeda's Gundam Wing and its resutling offshoots may be the most recognizable, but Mobile Fighter G Gundam was the first. Created by Yasuhiro Imagawa, the mind behind Giant Robo , this is a series that doesn't seem altogether straightforward, and it doesn't fit the mold in terms of the mecha genre (that's Imagawa's style), but it's still a fascinating series in itself. Sixty years ago, colonization in outer space began in a desperate move to escape the Earth's wrecked environment. Eventually, the rich and affluent moved to those space colonies, abandoning the Earth to the pitiful wretches left behind. They declared a new period, the Fighter Century, and declared that every 4 years the fate of the earth would be decided in a Gundam Fight tournament. Each nation would have a Gundam with which to fight and a champion to pilot it and represent his/her nation. The nation whose Gundam won the tournament would then become ruler of the Earth... until the next tournament. A Gundam whose head is destroyed is out of the tournament. Never attack the opponent's cockpit. Damage to any part other than the head may be repaired so the fighter may continue. A Gundam Fighter must protect his/her Gundam at all times. A Gundam Fight is a one-on-one contest. A Gundam Fighter must honor and respect the nation he/she represents. The Earth is your battlefield. So now, the latest Gundam Fight tournament has begun... but with a new twist. Domon Kasshu, the fighter from Neo-Japan, has come with two missions: to win, and to learn the truth about his brother, Kyoji. Incidentally, the calendar is how you can determine in which universe a Gundam story resides. If it's UC (Universal Century), it's the original Gundam universe. If it's AC (After Colony), it's the Wing universe. And if it's FC (Fighter Century), it's G Gundam. G Gundam is the first of the Alternate Gundam Universes, and has the reputation for being one of the wildest too. 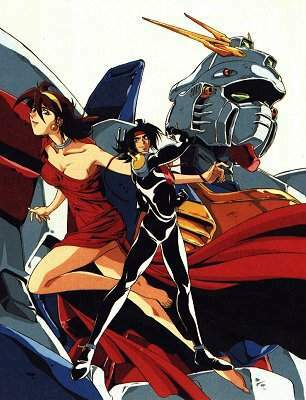 Created by Yasuhiro Imagawa (Giant Robo), G Gundam presents a vastly different take on the Gundam saga. Taking place in Year 60 of the Future Century, the colonies are about to hold the 13th annual Gundam Fight. The Gundam Fight is a tournament created by the Shuffle Alliance and held every 4 years by the colonies (each representing a different country) and are used in order to avoid War. Each colony/country uses their own respective Gundam and Gundam Fighter to represent their country. The Gundam Fighters fight on until the last one is remaining, winning the country's right to rule over the colonies for the next 4 years. The tournament is held on Earth, where most of the planet was wrecked by previous Gundam Fights and those left on Earth are forced to live under the foot of the wealthy population on the colonies. G Gundam focuses on Neo Japan fighter Domon Kasshu, who hopes to win the tournament with his Shining Gundam. However, this isn't his only purpose. Domon is also on a quest to find his missing brother Kyoji, who escaped to Earth with the Devil Gundam (Dark Gundam in the Dub), a technological nightmare that could ultimately spell humanity's annihilation. Traveling with his assistant Rain Mikamura, Domon meets and fights various opponents (some of which become allies and will share the same destiny as Domon) while tracking down his brother and the Devil Gundam. However, the influence and danger of the Devil Gundam is growing, and failure could ultimately spell humanity's doom. Will Domon Kasshu win the Gundam Fight and more importantly save the world from this dark menace?